If you read a Superman comic in the Seventies or early Eighties, odds are good that you read a story by Elliot S! Maggin. For fifteen years he chronicled the adventures of the Man of Steel in tandem with Cary Bates. When DC started making plans to revamp the character in the mid-Eighties, however, Maggin largely left the world of comics behind. Maggin interrupted his long hiatus from comics with only the occasional Batman Elseworlds one-shot or short story for Justice League Quarterly. In the last year, however, Elliot S! Maggin has slowly and steadily mounted a return to the world of comics. He authored a novel starring Marvel's Generation X team for Byron Preiss Multimedia Company and is writing the novelization of DC's epic mini-series Kingdom Come for Warner Books. And now, with two projects in development at his longtime friend Jeph Loeb's Awesome Comics, Maggin looks to be on the verge of a full-fledged comeback. The first project, a 48-page Prestige Format one-shot tentatively titled Seduction of the Innocent, will mix fact and fantasy as Awesome's heroes confront the darker side of the Fifties. "It's Supreme and Fighting American and a lot of Alan Moore characters like Professor Night and the Fisherman and what was going on in the real world at that time. A major character is President Eisenhower. Some other minor characters are Bill Gaines, Jack Kirby, and [Red-baiting U.S. Senator] Joe McCarthy. It involves the Army-McCarthy hearings," Maggin explains. "I can't tell you what the story is about, but what it is really about is people with specific agendas imposing them upon the rest of the world in order to advance their own careers." In Seduction of the Innocent, Supreme and the Fighting American will find themselves the subjects of Congressional hearings, much as comic books were investigated in the real world by Senator Estes Kefauver of Tennessee. The comic takes its name from a book entitled Seduction of the Innocent, written by Dr. Frederick Wertham in the early Fifties. Wertham's book purported to expose sexual overtones hidden in the comics of the day and claimed comics could and did cause children to become juvenile delinquents. The book led to Senator Kefauver's hearings, and it was these hearings that led to the creation of the Comics Code Authority, which set strict and often abusrd guidelines about what was and was not acceptable content for comics. The hearings also ended many comics creators' careers, as comics sales fell through the floor and reputations were ruined. "[Kefauver] was the guy that caused a lot of my friends to spend about ten years among the walking wounded. Kefauver brought up this comic thing in order to get the [Democratic Party's] Vice Presidential nomination in '56, and this was a major tool in what he perceived to be his elevation in the world," Maggin says. "The way to there was to screw up the careers of a lot of guys. And in the course of doing that, these [politicians] don't know what they are doing. They don't know what they're playing with, the lives they're screwing around with." Maggin feels that the richly detailed history Awesome has created for its heroes it what makes it possible for him to tell this story. This sense of history is something that Maggin sees most publishers at best avoiding and at worst rejecting outright. "A friend of mine who is a hot writer now with a larger company is saying things like, I wish this company wouldn't behave as if it didn't have a history. And what Awesome is doing is creating their history. They're doing it retroactively every day. They're unloading the backstory. And giving the public a chance to noodle around with history." 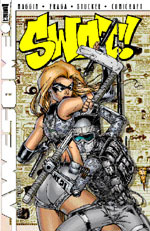 Maggin's other project for Awesome is a book called SWAT. Maggin describes it as "Bruce Wayne without the fortune. It's about the idea that you can be a superhero by training hard and being smart and going to the hardware store and buying lots of cool, cheap stuff. It was created by Dan Fraga. He did a five-page promo on the idea and I said, geez, this could be really good. And Dan said, I want to work with a writer. So I said, okay, I can do that." SWAT will tell the exploits of two teenagers who set out to make the world a better place. "It's about this 14 year old kid who has this mad crush on the head cheerleader, who is a head taller than he is, and his SAT scores are through the roof. And she's got this notion that she is in the world to do good in it. And that's what it is, these two kids that have decided that they are going to save the world. Or at least their little corner of it. And they do some good stuff. They never get screwed up, because their hearts are pure. There's nothing wrong with them. They're like the Nineties' Billy Batson." Maggin and Fraga will introduce SWAT in a story in next year's Fighting American annual. Many a fan has wondered why an exclamation point follows Maggin's middle initial. He credits the typographic trademark to legendary DC editor Julie Schwartz, who edited much of Maggin's earliest work at DC. "I got into the habit of putting exclamation marks at the end of sentences instead of periods because reproduction on pulp paper was so lousy. So once, by accident, when I signed a script I put the exclamation point after my 'S' because I was just used to going to that end of the typewriter at the time. And Julie saw it, and before he told me, he goes into the production room and issues a general order that any mention of Elliot Maggin's name will be punctuated with an exclamation mark rather than a period from now on until eternity." Maggin is clearly enjoying working at Awesome Comics. He credits the combination of talents at Awesome for both that company's early successes and for jump-starting his own enthusiasm. "You've got a guy like Rob [Liefeld] who's kind of intuitive about art, he noodles everything to death and what comes out looks wonderful. You give him a germ of an idea and what comes out is audacious and silly and wonderful. And you team him up with a guy like Jeph who has made his living figuring out what's sitting just below his consciousness and putting it on screen or on paper. And what you get is not necessarily a masterpiece every time you go out of the box, but a couple of guys who recognize talent when they see it. And if what you are looking for is talent rather than some obscure notion of the image your agenda dictates to you, then the product is greater than the sum of its parts." Maggin is eager to get to work on Seduction of the Innocent and SWAT. Just how eager is he? "I'm Jewish, and I made a resolution not to work on Saturday a few years ago," he says. "And last Saturday, I was pacing back and forth like a lion in a cage. I forgot how much fun writing comics is."